I posted this same picture on Instagram the day my May ecocentric mom subscription box arrived and I instantly got several questions about these boxes. 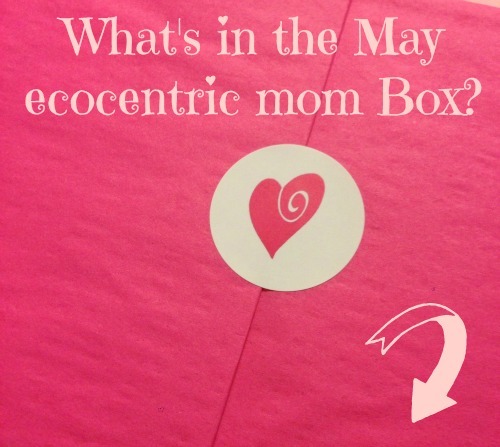 This is my 2nd month getting the ecocentric mom box and this months did NOT disappoint! One word…chocolate! 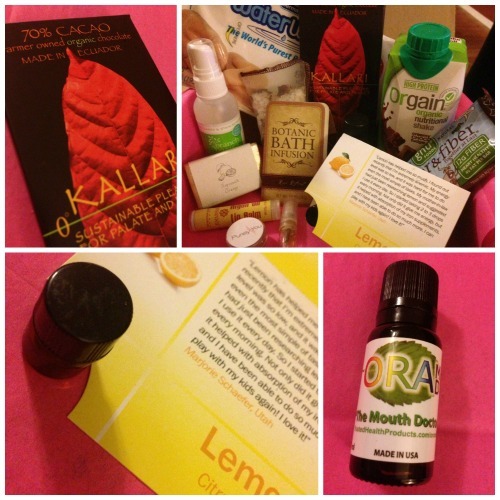 My favorite item in the May box was the Kallara organic chocolate bar. Once you eat really good chocolate you won’t want to buy chocolate from the grocery store register ever again. Plus organic chocolate is much richer so your sweet tooth is cured with just a small square (or two). It usually takes me about a week (if I don’t have to share) to eat a full size bar. There were a few other items to fill your belly including the Orgain certified organic nutritional shake (in chocolate of course) and a delicious Gnu Bar which was packed full of extra fiber. The very first thing I noticed when opening the May box were all the amazing fragrances (all natural of course) that filled the air. From bath salts, essential oils, and bar soaps. I’m still waiting for a night when the kids go to bed early so I can enjoy the Pura Botanica’s botanic bath infusion salts. There are a few other bath and body goodies including the FISIKA Greek olive oil soap and the Branch Basics hand cleaner and stain remover spray. One of my favorite finds in this months box is the OraMD. It’s a small glass jar of essential oil liquid toothpaste and mouthwash. With peppermint oil, spearmint oil, and almond essential oils as the primary ingredients I was a bit hesitant yet curious to learn more about how it works. I’ve been using it as directed (just a few drops on your toothbrush) and I love how fresh my breath feels once I’m done brushing. There’s no foaming action like regular toothpaste which takes a while to get use to. I’ve had both of my kids try it and my older one is the only one who can handle the strong minty feeling that it leaves. Me? I’m in love!! Disclosure: I am part of the Ecocentric Blogger Team and receive a box each month to review as part of the program. I’m also featured on their blog along with the rest of the blogger team! Check out the other great bloggers on the team! I am an affiliate with Ecocentric Mom and earn a small commission when you sign up for the program using the links in this post – thank you for that!